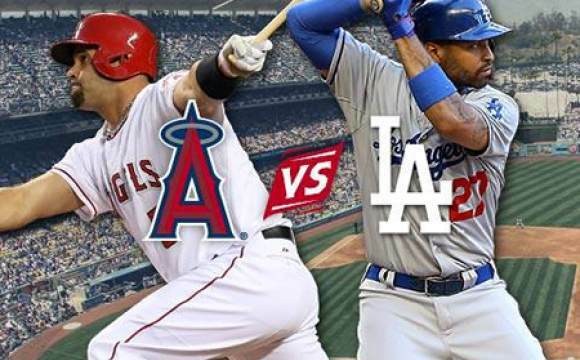 The last time both Los Angeles baseball teams made the postseason was 2009. In 2014, both the Angels and Dodgers will still be playing baseball after the regular season ends next week. The Angels had a disappointing 2013 season, finishing six games under .500 and in third place in the American League West. However, they have rebounded nicely in 2014. The Angels currently have the best record in baseball. At 97-61, the Angels sit 10.5 games ahead of the slumping Oakland Athletics in the West. Their torrid play came despite a season-ending knee injury to Garrett Richards, who tore his patellar tendon about a month ago. Richards had been the Angels’ best pitcher and one of the best pitchers in the league, and many thought this injury would spell the end of the Angel’s playoff chances. Former Dirtbag Jered Weaver and the rest of the Angels pitching staff have picked up the slack, giving the Angels’ potent offense every opportunity to win games. The Angels lead baseball in runs scored and have the third highest team batting average. They’re led by 23-year old phenom Mike Trout, who is widely regarded as the most complete young player in baseball. Trout looks well on his way to his first career MVP award. In the National League, the Dodgers sit two games behind the Washington Nationals for the best record in the league. At 90-68, the Dodgers currently have a 4.5 game lead over the San Francisco Giants for the NL West crown. A Dodger victory on Wednesday night would give the Dodgers their second straight NL West title. Home field advantage may not be a great thing for the Dodgers in the postseason. They’re 41-36 at home, but have the best winning percentage on the road at 49-32(.600 winning percentage). The Dodgers are led by pitching, namely Clayton Kershaw, who is widely considered the best pitcher on the planet. Kershaw won the Cy Young award last year with historic numbers: 1.83 ERA, 232 strikeouts, and a .92 WHIP. After signing a giant 7-year, $210 million contract in the offseason, many thought Kershaw would come back to earth this season. After missing five weeks with a back injury, Kershaw has somehow been better this season. Kershaw won his 21st game of the season last Friday in Chicago, and his ERA rose to 1.80. Kershaw also threw the first no-hitter of his career in June against the Colorado Rockies, where he struck out 15 batters and registered the second highest pitchers game score in baseball history. Kershaw is a lock for the Cy Young award, and many believe he could become the first National League pitcher to win the MVP since 1968. His toughest competition for the award, Giancarlo Stanton of the Miami Marlins, recently took a fastball to the face and suffered multiple fractures, so Kershaw seems like the frontrunner for the prestigious award. Each team has four games remaining, and have their playoff spots locked up. The only questions remaining are whether Los Angeles will be home to every World Series game in 2014. Coffee as a body scrub? Yes please!